Several protesters gathered at the site of a war memorial in East Los Angeles last Friday to object to the wording on a plaque installed at the monument to temporarily replace one of three plaques stolen in October. The dispute over the naming of the memorial — located at the intersection of E. Cesar E. Chavez, Lorena and Indiana commonly referred to as Cinco Puntos — is not new, but the recent act of vandalism at the site is once again heating up the controversy. At issue is what the proper name for the memorial site is and how it should be dedicated. 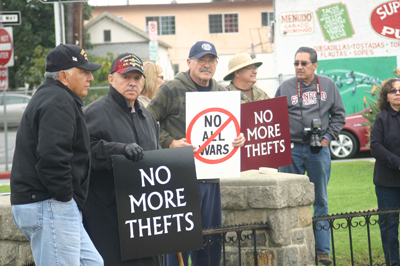 Eddie Morin, the son of Raul Morin, a highly decorated World War II veteran and author who passed away in 1967, organized the protest that consisted mostly of family members and a few members of Disabled American Veterans Chapter 22 based in Montebello. Raul Morin’s bravery and accomplishments during World War II are memorialized at the site. A plaque bearing the Spanish translation of those words still hangs on the opposite side of the monument, thought it was damaged by vandals who presumably tried to steal it when they stole the other three. Eddie said the original plaque made no mention of “All Wars,” but was instead a tribute to World War II veterans of Mexican descent, like his father. Reiterating a point he has made at past protests, Eddie said East Los Angeles already has an All Wars Memorial: it’s at Atlantic Park. “Intruders,” according to Eddie, put up the temporary plaque as part of their on-going “encroachment” campaign. He went so far as to accuse the parties who put up the temporary signage of stealing the original. Eddie’s brother David Morin, however, said that was just speculation. He told EGP there’s nothing wrong with the name “All Wars,” the problem is changing the name “just because you want to.” He said the move demeans his father’s accomplishments and those of other Mexican American World War II veterans. Veterans Rick Romero, Filo Morales and Richard Cardena told EGP they too oppose the wording on the temporary plaque and said it should be replaced with an exact replica of the one stolen. VFW Post 4696 Commander Tony Zapata, who watched the protest from a distance, told EGP on Monday that the temporary plaque is just that: temporary. He also said it reads “All Wars Memorial” because that’s what everyone has been calling it for as long as he can remember. Zapata is a member of the Mexican American All Wars Committee, a body involved in the planning for a multi-agency redevelopment project to turn the intersection and memorial site into a traffic circle. He said the name of the site was settled long ago and a plaque honoring Raul Morin, located on a second traffic circle, will be incorporated into the new project. As EGP has previously reported, a number of veterans feel the “All Wars” reference is more inclusive, and pays tribute to all of those who have served in the armed forces. Rick Coca, a spokesperson for Los Angeles Councilman Jose Huizar who represents the area, said a majority of the veterans they have talked to prefer that the site be referred to as the All Wars Memorial, adding that Morin’s legacy will be respected with the placement of the Morin Square plaque in the reconfigured intersection. Coca also said the councilman’s office and local veterans are working with Assembly Speaker John Pérez’s office to get a permanent replacement plaque should the police not locate the original. The protestors have a point. How would the Vietnam veterans feel if the Vietnam Veterans Memorial in Washington were changed to All Wars? Does the memorial’s smaller East L.A. location give it less importance? It’s bad enough Brooklyn Ave. was replaced by Caesar Chavez Avenue. With the memorial garden in planning stages, the school and parent council is looking for the support of the community to help make their vision a reality.